Talk is cheap. To convince consumers that Microsoft believes in the consumer, it needs to launch new products and services, not just rebrand the Surface Go and Cortana. Consumers, rejoice: Microsoft cares about you again. Maybe. It depends on whether the head of Microsoft's new Modern Life & Devices group has substantive plans behind his statements. For the past few years, Microsoft’s attention has been fixated upon the enterprise. While the company has built products like Azure and related services into thriving businesses, consumer-focused products like the Groove Music service, Microsoft Band, and Windows Phone have fallen by the wayside. 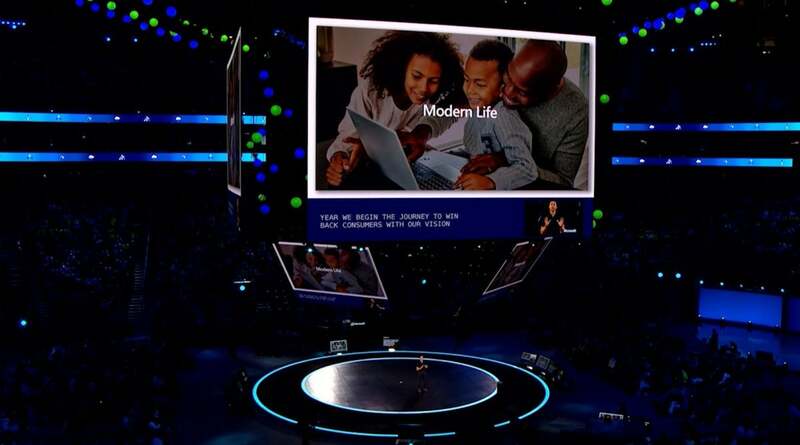 Microsoft essentially acknowledged its neglect of the consumer market at the company's Inspire partner conference this week. Yusuf Mehdi, now the corporate vice president in charge of the Modern Life & Devices group within Microsoft, led a closed session on "Modern Life Services," according to ZDNet’s Mary Jo Foley. A tweet that Mehdi posted from the event includes the words, "we begin the journey to win back consumers with our vision," presumably this year. To be fair, Microsoft maintains an enormous consumer business around the Xbox gaming console, reporting over $2.2 billion in revenue for the most recent quarter. Xbox aside, however, most of Microsoft’s “consumer business” relies heavily on the blurring line between the business professional and the consumer, and the ease with which individuals can move between both worlds. You can see evidence of this duality within Microsoft’s own services. On one hand, it offers enterprises services to restrict the flow of confidential business information outside of the corporate firewall. On the other, a series of smart "nudges" within Outlook are designed to remind workaholics that their colleagues want to enjoy a personal life away from the office. No one would really confuse Outlook with a "consumer" product, though. 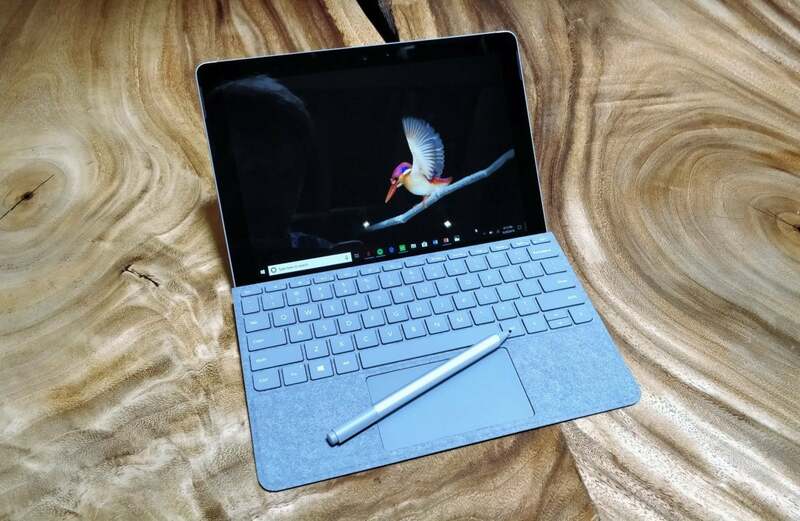 Devices like the Surface, and especially the upcoming Surface Go, are a little trickier to classify, as they’re designed to be used both at home and in an office environment. Is a Surface a business PC? A consumer device? Most customers probably don't care. But it’s here that Microsoft can simply wave its hand and say “Voila! We’re serving the consumer now!” without really changing anything. The Surface Go represents the intersection of the business user and the consumer, without explicitly serving the needs of either. Microsoft will have to dig deep to reposition its existing services as consumer-friendly. Foley reported that Mehdi identified two services, the “Your Phone” app and Cortana, as ways that Microsoft would begin to re-address consumers. Your Phone, an app to connect a phone to a PC for sharing photos and other information, seems like a weak attempt to reproduce a feature that virtually every manufacturer already provides in some way, whether it be Android itself or with manufacturer-specific apps that come bundled with laptops and tablets. There's an easier argument to be made that mobile apps for Android and iOS, such as the Microsoft Launcher, more explicitly serve the consumer. But they represent a small fraction of the users on either platform. Cortana, on the other hand, is a true consumer service. The trouble is that there’s little evidence that the majority of Microsoft’s users have adopted it. In 2016, Microsoft disclosed that Cortana had fielded 6 billion queries since the rollout of Windows 10—but it certainly wasn’t clear how many users that represented, or the frequency with which they used it. When I sat down with Cortana chief Javier Soltero earlier this year, he said that Cortana’s role was projected to expand far beyond Windows, such as to Office and other services, to provide helpful advice, context, and more. The problem with this particular strategy is the line Microsoft must carefully walk. If it’s too subtle, Microsoft’s users might not even notice Cortana's assistance. But a vocal component of the Windows base has reacted with outrage to pop-up "ads" within Windows that suggest users take advantage of OneDrive, Edge, or other services. All it takes is one mistimed "Can I help?" notification, and some users will be up in arms. There’s an argument to be made that Cortana on Windows Phone epitomized what Microsoft’s digital assistant should be—an assistant that stayed by your side on the go. Today, she’s a little harder to find within Android and iOS devices. Somewhere in the middle, though, lies the Microsoft apps and services that explicitly cater to the consumer—and have been first on the firing line in the past years. For whatever reason, Microsoft killed off the Zune music player and then, later, the Groove Music music service—but then implemented an ebook store deep within the bowels of Microsoft Edge. The Microsoft Band came and went, and we all witnessed the prolonged demise of Windows Phone—though its heart still faintly beats with a sporadic update. Does “Modern Life Services” foreshadow the rebirth of another Windows phone, or even the rumored dual-screen device, Andromeda? Who knows. That’s what Mehdi’s pledge boils down to: substance versus semantics. Microsoft still retains a piecemeal consumer offering, with movies, TV, and books living within the Microsoft app store. Gamers may debate which console is currently winning, but the Xbox is clearly in the mix. 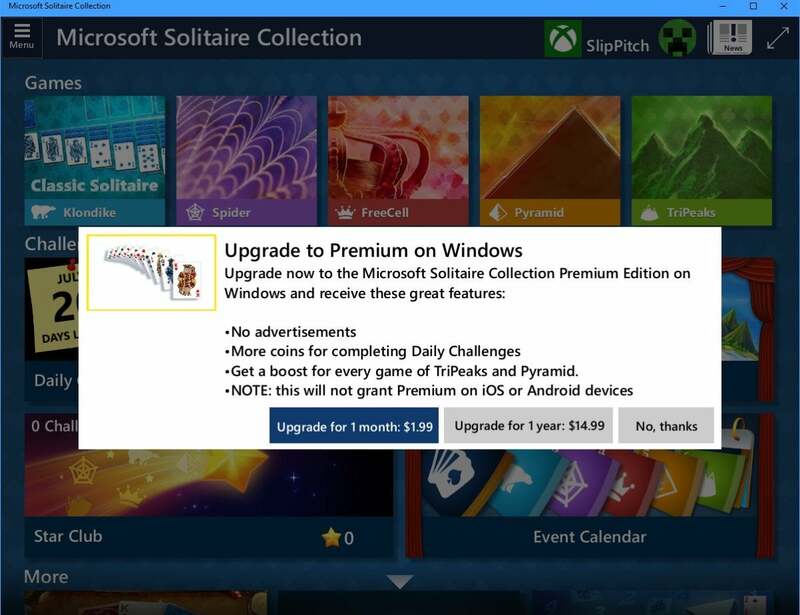 Heck, even Solitaire’s still buried within Windows—and yes, still with an optional subscription. It’s not clear, though, who within Microsoft is championing the cause of the consumer. There’s no overarching, public strategy. You can point to different parts of the business—the Xbox here, movies there—to support an argument that Microsoft has maintained a consumer presence. But as Microsoft has abandoned these individual consumer apps and services, that argument crumbles. 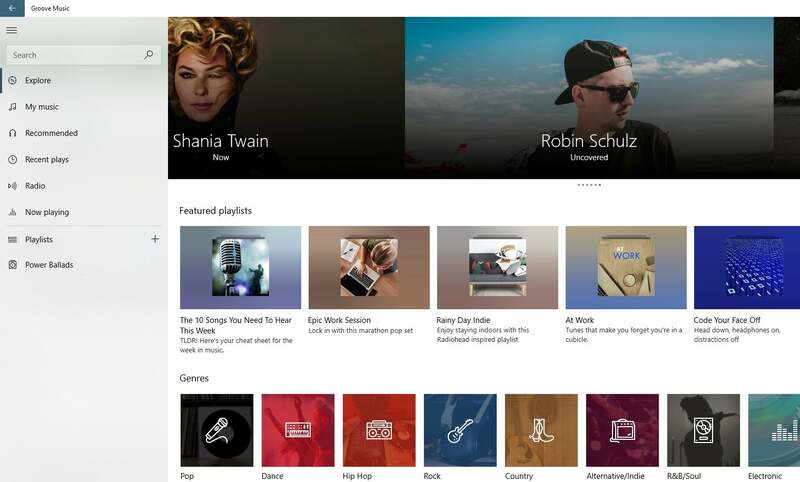 Groove Music may have been replaced by Spotify, but it ended up as a surprisingly useful music service, with recommendations and other useful features. But developing these took far too long, and in the end, competing services won out. Mehdi needs to lay out a series of explicitly consumer-oriented apps and services, then start knocking them out, on a regular basis, with iterative improvements and features and feedback, and the works. Put a public face on the effort, get consumer hardware makers behind it, actually run a commercial or two to promote it. Sell it.